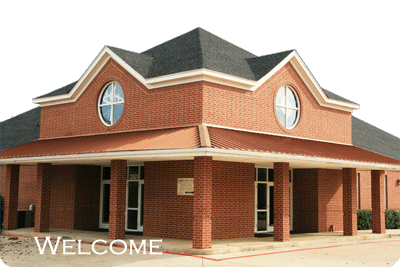 Sunday, January 9 was the first official Sunday at the new Southlake campus of The Hills Church of Christ. Sherrylee and I attended the service as did 524 other people—a number too large for the sanctuary—a wonderful problem to have! The energy was high and the sense of anticipation strong. Lots of young families were there, lots of children! Chris Hatchett, the campus minister, did an excellent job of introducing himself to those attending the adult class at 9:00. That things were different was obvious from the moment you walked in the door and were greeted with the bulletin and worship program from The Hills. The worship team on this Sunday was mostly from The Hills, and even the call to prayer and benediction were The Hills style. God provided a little icing for the cake: as the back doors of the auditorium were swung open at the end of the service, all were surprised to see that it had begun to snow during services—a Bing Crosby moment for everyone! We left feeling the Breath of Blessing on this place in the Kingdom of God! I woke up this morning, thinking about the kinds of questions that these leaders are asking and praying about. I guess this kind of thinking is just in the blood of us missionary types. Sorry! I still drive by vacant commercial property and briefly evaluate it as to whether it would be a good place to locate a new church, just like we did in Germany so many years ago. How alike and how different should the campuses be from the mother church? The current metaphor governing The Hills new campuses is, according to the public announcements, that the campuses will be “twins, but not identical twins!” This approach is probably based on this assumption: The Hills has a successful program, a successful style, one blessed, so why change the formula? While this approach is perfectly rationale, I suspect the leaders have had to wrestle with some or all of the following questions—and if they haven’t yet, I think they will certainly be on their agenda in the future. Question 1. Is it possible that different campuses will have different demographics from the mother church which might require significantly different approaches? The Hills is currently launching two new campuses, one on the west side of Fort Worth and the Southlake campus in the northeast corner. The west campus is about thirty miles from the Southlake campus. Both satellite campuses are 10-18 miles from North Richland Hills, where The Hills is located. Having grown up in Fort Worth, my sense is that the west side campus is located in a more western, pick-up truck demographic, and the Southlake church in a suburban, SUV demographic. The mother church is enough of a megachurch to draw from a much wider area than its geographic location. What this says to me is that you have the potential of very different subsets of people likely to attend the different campuses. If these differences are real, that would argue to me for allowing enough variety and differentiation on each campus to address those differences. Question 2. Is a blended church different from a new church plant? The west campus is a true church plant while the Southlake campus is a merger/blend—two very different starting points. The Hills has provided all of the new leaders and staff for the west campus by either reassigning people from the main campus or hiring new staff. The Southlake campus had a full slate of elders and a small staff. The elders resigned and the staff members were kept on the staff of The Hills—at least for a while–though some were given different assignments. I kept wondering yesterday if the working assumption—a perfectly natural one– is that the main campus staff and leaders were more gifted than the ones inherited from the merged church? I raised this question at lunch yesterday and a corporate attorney friend replied that in his experience, in every takeover there is a winner and a loser and whoever takes over is the winner and calls all the shots! He said, all corporations talk about equality in the new blend—but it never happens. The winners stay and the losers go home! I know this is true in the business world, but my prayer is that churches who are seizing an opportunity to merge or blend will never frame any of their decisions with this winner/loser framework! I don’t believe The Hills/Southlake leaders did this. Not using this corporate framework, however, would mean that even the bigger church would be open to learning from the smaller, that the stronger church would recognize the golden nuggets that even weaker churches might contain. What if the minister of____ from the subsumed church is more gifted than his/her counterpart at the main church? Who should be setting the agenda for that ministry? Is it automatic who goes and who stays? Could the main church be improved by the campuses? Question 3. Isn’t it likely that each campus will grow and change at a different rate? Won’t the need for the inevitable changes that accompany growth occur at very different moments? A good example of this is that the Southlake campus began with just one service, but probably needs to move to at least two services already. The plan currently is for two elders from The Hills to shepherd the Southlake campus, and for “local” elders to be selected sometime in the future. Having two or three services immediately, mushrooming children/youth programs, greater benevolence needs, unique outreach opportunities –all of these evolutions demand more leadership, more prayer, more attention and more resources. And each campus will face them in different moments! Finally, I’m thrilled that The Hills has had the vision, the boldness, and the courage to accept these Kingdom challenges. I’m sure these questions have been raised and discussed by church leaders at The Hills who think about these things 24/7! It is a great time to learn from their experiences. I also believe the option of merging churches for the good of the Kingdom will be seriously considered more and more in our fellowship, and if we talk and think and pray together, God will do even greater things than we can imagine! Thy Kingdom come! Thy Will be done!